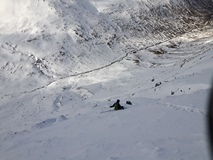 The course includes clothing and equipment, winter mountain hazards, weather, navigation and route finding through differing types of terrain, snow holes and emergency shelters, use of crampons and ice axe. Depending on weather conditions an overnight expedition may be undertaken. The outcome is for the candidate to be a competent member of a group led by a qualified Winter Mountain Leader.